Once you create a template, you can use it in Gmail and Outlook. You can also add attachments while creating templates for Gmail and Outlook. You can create folders to organize templates effectively. Create folders and share it with your team with various preferences and access. Use templates while sending mail merge campaign with automated follow-ups. Create follow-up templates and use in follow-up emails. Create HTML templates in SalesHandy and use it in Gmail. Paste your HTML code in source code window and your template will be created. Share your personal templates with your team members with just one click. Differentiate Gmail email templates with Team and Personal labels. You can measure template’s performance by analyzing success rate of each template. It is the percentage of template’s usage divided by Open count. Can I edit or delete templates which I have created? Yes, you can delete templates. After deleting, you will no longer see templates in your Gmail. Can I use templates while sending follow-up emails in mail merge? Yes, you can use templates while creating a mail merge campaign. You can see the list of templates in compose box. Can I create and save templates from Gmail? Yes, you can create and save email template directly from Gmail using SalesHandy. 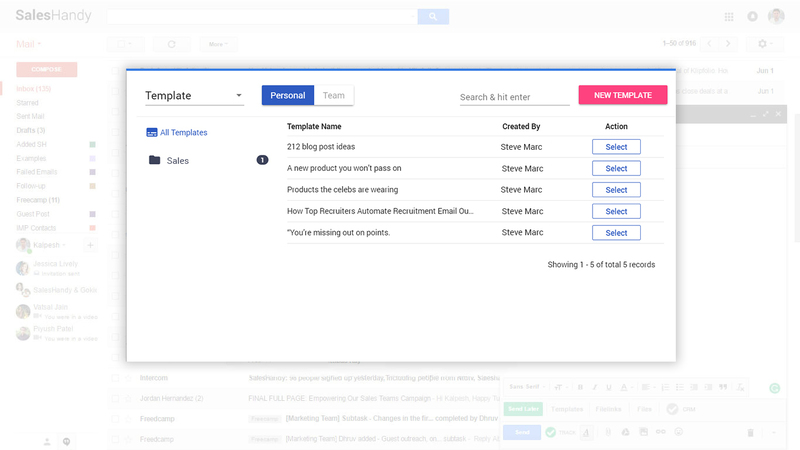 How does SalesHandy count Success rate of templates? Success rate will be counted based on template’s usage and open rate that particular template gets. Why are my HTML templates not formatted properly? You might have copied data from MS-word, website, an old email, etc. When you copy data from one source and paste it into your template, a lot of hidden formatting added into your template. This formatting does not support in all email clients. Solution: In order to create your template by copying data, we strongly recommend first passing it through a plain-text editor. Copy your text and then paste it into the plain-text editor to strip out all the formatting. Then, copy it out of the plain-text editor and paste it into your template. Does SalesHandy provides pre-saved email templates? Yes, currently we provide three pre-saved commonly-used email templates. We have planned to add more shortly. Save your time by 3x using templates.